Site selected by President Thomas Jefferson and Lieutenant Colonel Commandant William Ward Burrows on 31 March 1801. A National Capital Landmark and entered in the National Register of Historic Places. Location. 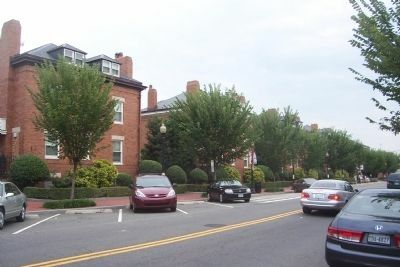 38° 52.779′ N, 76° 59.688′ W. Marker is in Capitol Hill, District of Columbia, in Washington. Marker is on 8th Street, SE near I Street, SE. Touch for map. 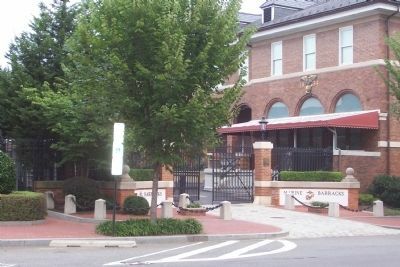 Marker is at the Barracks' main entrance, on the gate post opposite the National Historic Landmark marker, a few yards north of the famous intersection of "Eighth and Eye". Marker is in this post office area: Washington DC 20390, United States of America. Touch for directions. Entered in the National Register of Historic Places in 1972, and subsequently designated a National Historic Landmark by the Department of the Interior in 1976. (about 700 feet away); John Philip Sousa (approx. 0.2 miles away); Christ Church and Its Parishioners (approx. 0.2 miles away); Washington Navy Yard: Serving the Fleet (approx. 0.2 miles away); In the Alley (approx. 0.2 miles away). Touch for a list and map of all markers in Capitol Hill. 1. Buried Treasure at Eighth and Eye. In August 1814, as the British Army approached Washington, two sergeants of the detachment at Marine Headquarters (then located at the Marine Barracks) were, so the story goes, charged with the safety of a chest containing a considerable amount of Marine Corps funds. The Marines were supposed to have buried the chest on the grounds of the barracks or to have hidden it within the walls of the Commandant's House. They then rejoined their comrades on the battlefield of Bladensburg where they were killed in the fighting, taking the secret of the money's location with them to the grave. 3. 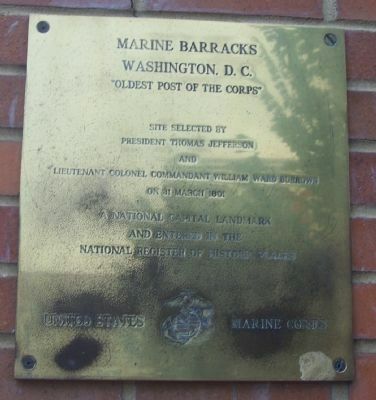 Main Gate, Marine Barracks, Washington, D.C.
More. 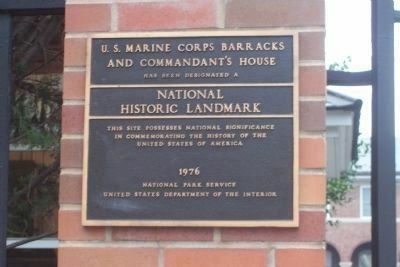 Search the internet for Marine Barracks, Washington, D.C.. Credits. This page was last revised on September 10, 2016. This page originally submitted on August 6, 2008, by Richard E. Miller of Oxon Hill, Maryland. This page has been viewed 4,099 times since then and 17 times this year. Last updated on August 29, 2008, by Richard E. Miller of Oxon Hill, Maryland. Photos: 1, 2, 3, 4. submitted on August 6, 2008, by Richard E. Miller of Oxon Hill, Maryland. • Kevin W. was the editor who published this page.